What if my pattern collection doesn't include the style that I'm looking for? This is one of those FAQs that comes up often. Even though Lutterloh manuals come with a full 280 patterns these days there may be a particular style that just isn't included in your collection. This exercise is meant to help you make the most of the patterns you have. With a little dart manipulation you can change the style of a basic pattern to a different style. 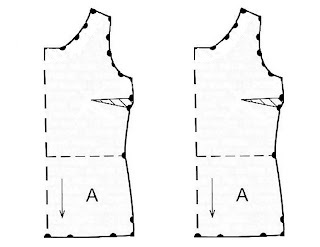 Below is a bodice worksheet and a link to Fonnell's post with a dart movement chart to help you with this exercise. Feel free to save this image to your computer so you can print it out as many times as you like. This happens to be the front pattern piece for a top but the same principals can be applied to any dress pattern as well. There are already many pages on the internet devoted to demonstrating this technique. Just do a search for "rotate a bust dart". The basic premise of this exercise is to close the side bust dart on your pattern and then move that fullness to another area of your pattern. Here are a couple of examples of what I came up with when playing around with my miniature patterns. The pattern on the left would move the dart to the upper neckline which could then be sewn in darts, tucks or soft gathers. The example on the right would result in a gathered center front neckline. I like to leave a tiny hinge of paper at the bust point so my cut pieces are still attached to the pattern. I have marked the new cutting lines in blue pen. On the right you may notice I have marked two lines. For the one in pen you would need to add seam allowances and would result in a center front seam ending at the bottom of the gathers. For the line marked in pencil you could still cut the bodice front on the fold of fabric but you would need to gather the center front more, perhaps with some clear elastic at the gathers, resulting in a slight V neckline; my personal preference for this style. Depending on the size of your original side dart you will likely need to smooth out this cutting line as well. Maybe you have a simple sheath dress pattern and need to dress it up for an evening out. Almost every Lutterloh book I've seen has a basic sheath dress style in both average and full figure sizes. If yours doesn't don't let that stop you from taking a top pattern and extending the length or if you need just a top how about cutting the pattern off at or below hip level. Here are a couple of examples of rotating the darts to give you some embellishment opportunities. When the darts are closed at the neckline on the left or the shoulder on the right you can easily add some strings of rhinestones or pearls to dress up your sheath. Of course the fabulous fit of your dress will shine through making this an excellent choice for that "little black dress". Notice that I have drawn back in the center front straight up to the neckline. I have also flattened out the rounded neckline a little. The drape of the neckline will create your round neckline again. Keep in mind that draped necklines typically drape much better if the pattern is cut on the true bias grain of the fabric. I have drawn in a new grainline at a 45 degree angle to the center front. Note: If you cut the pattern off grain to the true bias you can get twisting of your draped neckline. I don't want to overload anyone with too much information at once so I'll leave this exercise to just bodices for now. If you're interested in even more information on how to change your current patterns into more styles I can recommend a few books that have many more examples. Practical Dress Design by Mabel D. Erwin - my copy is from 1954 but there were previous editions from 1933 & 1940. Designing Apparel Through The Flat Pattern by Ernestine Kopp, Vittorina Rolfo, Beatrice Zelin and Lee Gross. Patternmaking for Fashion design by Helen Joseph-Armstrong. Fonnell's favorite is Pattern making by the Flat pattern method 4th edition by Norma R Hollen. I believe these were all textbooks at one time so sometimes they are a little technical but still worth reading through. All of mine were acquired off eBay at one time or another. If all this slicing and dicing of patterns seems a little overwhelming to you I would still like to encourage you all to take a second or even a third look at the Lutterloh collection you have. If you look closely you will probably find that you have a pattern for nearly any garment you might like to make. Please consider all your options, for instance: on patterns with waist seams you can exchange a straight skirt for a fuller one and vice versa. Dresses can be used as nightgown patterns, nightgowns can be used to create full slips, elastic waist skirt patterns for half slips and the list goes on. I hope you're beginning to see the possibilities here. Take another look at your Lutterloh patterns and I hope you too will see that you have a real goldmine at your fingertips. Just open your mind and let your imagination work! Thank you Ann. This has been very helpful. You have given some very useful tips and I look forward to trying them out! Great post Ann! Thanks for taking the time to post links, pics, before/after diagrams. Makes everything very clear. Enjoying your blog very much. Hi Ann, Please excuse if this seems a daft request but could you do a posting about adding the seam allowance on patterns. I have only ever sewn (years ago) from commercial patterns and seam allowances were always included. My Lutterloh kit arrived yesterday and the only thing making me nervous is getting the seam allowances in the right places. Any tips and things to remember would be appreciated. The dart manipulation post isn't half as scary as I thought it was previously... thanks for lifting the mystery. If you are new to Lutterloh go to the beginning of our postings. Sadly I deleted some of the best parts of this blog when Lutterloh asked me to close down and I haven't had time to restore the posting on seam allowances but it's very easy. 2. Get a ruler, little ones are useful. 3. Choose the size you want your seam allowances. I use 1/2" but on a newly drawn pattern I use 1 inch on the sides and the shoulders. This allows 4 inches for bust and hip adjustments, and 2 inches to fit a slanted shoulder etc. 4. Add the hem, I choose that based on the fabric mostly a 2 1/2" on hems. 5. CAUTIONS: don't forget to add seam allowances on yokes, princess seams, cuffs, Add button bands where it's not already noted. All edges that must meet another edge needs a seam allowance, all edges not touching another will need a hem or a facing. Remember to go see my step by step directions on making your first pattern. Read all you can and it will make you feel more secure. They are are the beginning of the blog see the right side listing. P.S I put a little dot next to my ruler at 1/2" every 4 to 8 inches away. Once I go around the whole pattern I connect the dots write the 1/2" seam allowance on the paper pattern and cut the pattern out. Ann, I'm also new to Lutterloh but not to sewing. Your pattern fitting instructions are very clear - thanks for taking the time to write them up. Is there a forum here for asking general questions about the Lutterloh patterns? I just started working on my first Lutterloh pants and the first draft of my pattern did not fit as well as I'd hoped. I used the hip measurement to draw up the entire pant pattern. Should I have used the bust measurement on the waist area? I'm using the plus-size patterns. Please contact me via e-mail. I too am a plus size and have had problems with the pants. I can tell you what I did. P.S. Please everyone only e-mail me if I ask you to do so other wise send your comments to the blog. Everyone wants to see what's going on. Hi Louise, I personally cut out my patterns without seam allowance and trace it right onto the fabric with pencil or a chalk pen. I use a clear quilting ruler so I can see through to the edge of the pattern and only mark every few inches. I don't always use the same seam allowance from one use to the next so I prefer to draw it on for each different fabric choice. Once you get used to marking them this way you get pretty good at eyeballing the seam allowances. I also found that if you do a Google search on adding seam allowance it will turn up web pages describing even more different techniques. There's no one right way to do it. You just need to find a way that works best for you. Try to relax and enjoy the process. I appreciate this post so much. It took some of the apprehension out of using my new patterns. I was too late for the vintage sewsocial, but was able to use the Lutterloh sheath pattern you showed above and shape the top into what I wanted, add a waistband and straight cut gathered skirt and pocket, straps and ties and came up with a lovely gingham apron. What exciting news! Can you send us a photo with permission to post it? Everyone would love to see what you did with that Sheath dress pattern! I have questions about pattern 240 (MM-023911). It looks to me like a dress with a blouse under it. When I look at the pattern I see 240 cuts off at the waist line of the bodice. Does that then attach to the skirt waist band? I see a zipper on the skirt (but the skirt is for 239 - no skirt for 240). I was thinking I could add a couple of inches to the bodice to make it blouse out like the picture, leave out the darts on the skirt, and put an elastic waist in. Also, the woman I am making this for is 114 bust and 102 hip. I would appreciate your help on this. Thank you. I've been working a new job recently and didn't see your comment until now. The fashion drawing looks more like three pieces to me, a shell with overblouse and separate skirt. There are not always patterns for every piece shown in each drawing. I don't believe 240 is meant to attach to the skirt. If it was the skirt pattern would be numbered 239 & 240. I would definitely extend the length of the blouse beyond the waist for someone with a larger bust. If you do decide to make the skirt an elastic waist style remember the waistband needs to be at least as large as the hip measurement to be sure she can get it on and off. Good for you for making your patterns work for you. If you have any more questions just ask. I have been using Lutterloh for a while and had a question: Is it possible if you have a design, i.e., a picture from a magazine. Can you send this to Lutterloh and they can make it so we can draft it for a personal fit? we don't have very good contact with Lutterloh, you can contact them through one of their web sites. We find they are happy just selling the pattern books. BUT you can copy just about any magazine fashion from your lutterloh book. Can you e-mail me a scan of the picture and I will show you what I mean! Thanks for taking the time to post links, pics, before/after diagrams. Have just found this wonderful blog Thank you for so much information. Can you explain to me how to calculate the yardage needed from the pattern? This is easy....lay out your pattern pieces as if on fabric of the width you usually find. Add plenty for pockets, facings etc. Take your yard stick and measure! The patterns do have a fabric notation it will be two numbers with a x between them. They are the metric size of your fabric for the pattern of a normal sized person. In the newer pattern books this is below the fashion picture, in older patterns it can be anywhere on the pattern and in the really vintage patterns there isn't a fabric number. It is wise to lay out your pattern and measure for your size. Hi. I live in South Africa where Lutterloh doesn't seem to be known at all. I have just visited the USA and bought my Lutterloh kit. I am trying out my first pattern, but I am getting confused with the series of measurements indicated outside the pattern outline, i.e. where you see a row of numbers instead of just one. I have had four attempts at trying to draw up a princess style dress and it's not clear how far to cut the sloped parts, e.g where it looks like a cut-out dart. Where can I get directions on your site regarding drawing your first Luttrloh pattern? Anonymous, on the right sidebar of the blog is a list called "Where to find what you need on our blog". Number one on that list is "How to make a pattern". When there are a row of numbers instead of one it just means you should use that same line to line up your tape measure and make a dot at each number. Usually, for a princess line pattern, there is a dot indicating the bottom of the dart where it should end. If this isn't the case perhaps you could let us know exactly which pattern it is and we could take a look at it. Have you made the fitting vest first? This should always be your first Lutterloh pattern so you can determine any adjustments that need to be made in all your Lutterloh patterns. The first apron photos are in!